Courtesy to Watsons Malaysia, I had a fabulous pink date with Pure Beauty, a Korean skincare brand that is exclusively brought in and only available in Watsons stores. 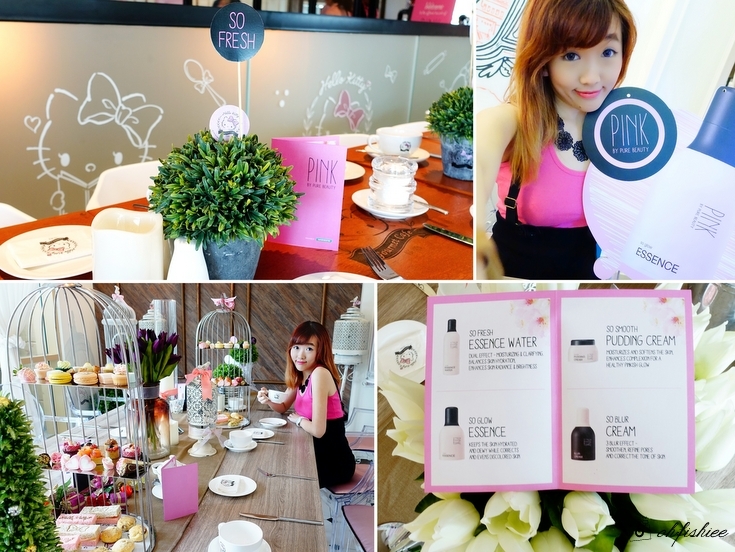 Knowing that the latest range of skincare by this brand is called "PINK", I'm so excited to dress in pink and attend this special sharing session with the babes and Malaysia's hottest makeup guru, Steven Sunny. I am totally blown by the beautiful pastel pink decor that the team has put up for this event! Pink by Pure Beauty is a range of 4 products: Essence Water, Essence, Pudding Cream and Blur Cream. Packaged in super cute pink and black bottles, this range is formulated using Pink Flower Complex Power, Alps Rose and other active natural whitening ingredients, to bring you the best of brightening and moisturizing effects. Here are 4 steps to turn your skin into glowing pink tone! 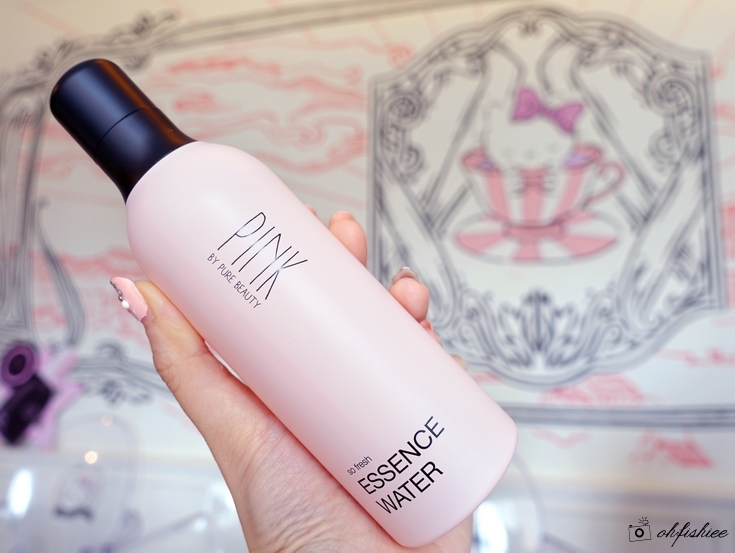 The essence water is similar to a toner. If you have dry skin like mine, then it is best to soak cotton pads with this and leave it on to the cheeks and forehead for 10 minutes to get the instant rehydration. Otherwise, spraying it onto the face is equally great to allow better absorption. 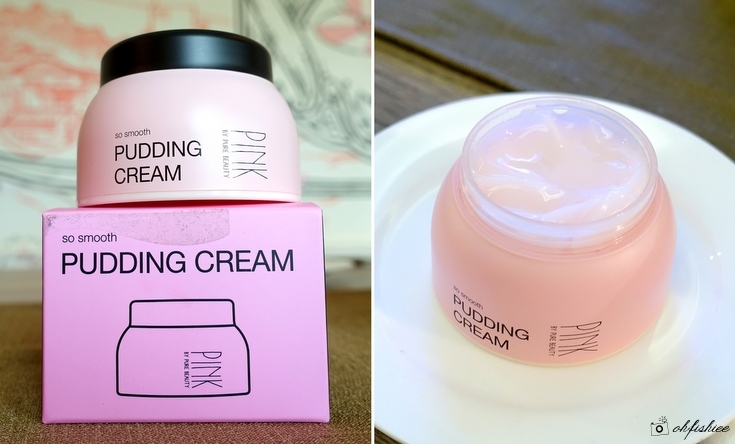 The pudding cream is the star product of this range! Definitely a must try! Why? Because it helps to soften skin and leave it supple even during hot humid weather especially in Malaysia. The gel-like texture feels smooth on the skin and is easy to blend, without any sticky feeling at all. And the best part is, it feels so cooling on my skin upon application! The last step is the Koreans' latest obsession: Blur Cream. As in blurring our complexion so that it appears poreless, moist and translucent at all times! My personal favourite too! It does a great job in correcting skin tone and refining pores. Overall, I am happy that it gives a fairly good coverage that can easily replace my CC Cream during the days that I feel like going for basic, "makeup-less" look. Of course, for fuller coverage, don't forget to try Pure Beauty CC Cream SPF30 PA++! I love this line the most from Pure Beauty! Wished I was in town to join you all. You girls look so pinky beautiful! Wish I could be there too to test their product. Looks like a decent product tho. Such a nice place to have event at this cafe. Makes me wanted to try all these product ler! Since I am currently looking for a perfect and affordable skin care to use! =D Lovely place for these lovely product! watsons have come a long way. Evolving from a reseller to selling products with their own branding. Siapa nak set pure beauty pink sy nk let go. Ade essence water, essence, lotion, pudding cream dan blur cream. Satu set sy letgo rm 130 sahaja. Bru pakai 6 hari.. Xsesuai dgn kulit sy. Hi. Essence shj brp ya? Create playlist of your favored videos rate materials to show your level of similarity. HotStar With the Hotstar application you could get to enjoy all your favored movies.